I look like I have short hair, the side plait clearly back fired! Hence the last photo where my hair is actually visible. The dress seems to get shorter every time I wear it, hence the cycling shorts underneath, which D thought looked like I was wearing suspenders. Perfect for a family barbecue then. The sandals are a recent purchase with a Westfield voucher I had- quite comfy to wear although after a few drinks easy to slip out of (you know when your foot misses the base of the shoe and you nearly fall over. A lot). Want to make the most of the bank holiday- perhaps heading to the 19 Princelet Street Open Day, if I can get up from the sofa that is. Enjoy the bank holiday. 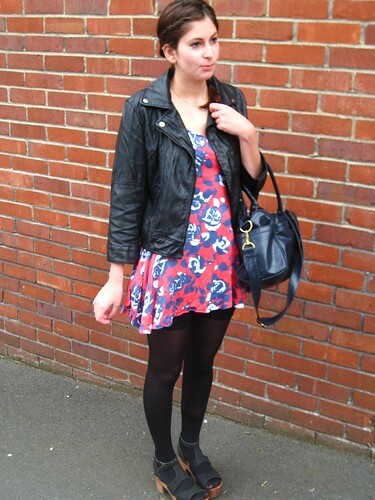 I like the side plait, and your leather jacket looks really great with the dress. Holidays are just lovely, aren't they? So much potential, especially if the weather cooperates :) Lovely outfit, happy to be reading your posts once again! beautiful outfit! very Alexa Chung! Love the sandals! Ooh, those shoes! I was drooling over them on the topshop website. I have some clogs though, and they're equally slippery when drunk! Love the side plait! My hair seems to have decided that it wants to be in a side ponytail ALL the time and won't stay straight - most annoying. you look AWESOME, love the shoes with the dress! hehe I tend to wear cycle shorts under my dresses too! Gorgeous, you are so so beautiful, dear! And oh, the sandals... Oh my. I want them. What a unique look! I think it's really neat how you paired tights with sandals and made it look amazing. Due to my shortness I don't know if I could pull that off but I love what you did! Those shoes paired with black tights = amazing. I love the look. I love that you paired such a bright dress with all black, the contrast is just gorgeous! Pretty dress m'dear, your hair looks lovely! I almost bought that very dress....awhile back:) I just adore the print on it. The shoes are awesome and I love the side plait...gorgeous!! Sadly I haven't read the Game of Thrones books! I'd never heard of them before the series sadly, and now I don't want to read them because I don't want any spoilers for the series :P I'll probably read them over the summer though, just to get my daily Jon Snow fix, haha. I adore your beautiful shoes! Cute look though I do not see the suspenders part haha.. I am obsessed with that leather jacket! I love the shorts underneath! Its brilliant. I'm totally going to do that with the shorts poking out next time I'm biking in a dress. That dress is so pretty! I usually wear biking shorts underneath dresses too, but never thought of having them show! I think the side plait looks lovely, too. your braid is very cute!i m addicted to them!they are just so practical and feminine at the same time- difficult to resist!